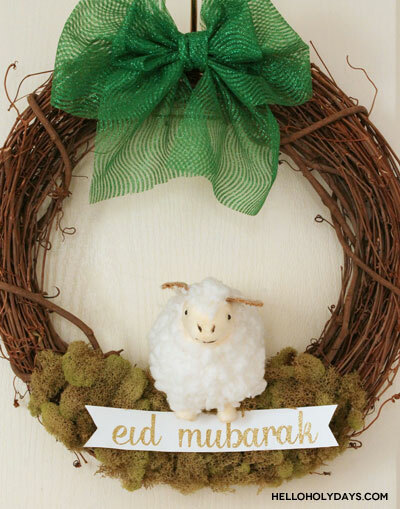 Simple Eid al Adha Sheep Wreath – Hello Holy Days! What’s a holiday without a wreath? This simple Eid al Adha sheep wreath takes next to no time to make and it will look so good hanging on your front door come Eid al Adha! For easy hanging, use a wreath hanger to display this simple yet chic wreath. As guests walk in your door, this festive decoration is sure to get them into a holiday-ready mood! Make a large decorative bow using tulle ribbon following the steps in the video below. I used pieces of tulle ribbon that were about 35″ and 20″ in length but you can customize this based on how large you want your bow to be. Use the hot glue gun to add moss to the bottom half of the wreath. Hot glue the toy sheep in the centre of the wreath. Cut a decorative banner shape from the white cardstock. Use gold stickers to spell out “Eid Mubarak” on the banner. Hot glue the banner to the moss. Hang the wreath using a wreath hanger.